Mummy on the Orient Express has a lot of similarities with the David Tennant story Voyage of the Damned in that it was set on a famous and iconic method of transport transposed into space and that is features a pop star in it and that lots of people are killed and are left to float in space. That is where they are similar, but I would have to say that this is a better episode in itself. I was impressed with the interior of the Orient express which looked as it would have done in the 1920’s with all of the occupants actually looking like they were from that period of time, and looking like they had stepped straight out of an Agatha Christie drama. Well that was until a mummy started walking through the carriage and killed an old lady that is, and later on when the interior of the train became a high-tech laboratory. Frank Skinner guest starred in this episode as Perkins the chief engineer on board the Orient Express who dressed just like a 1920s engineer would have. Skinner was very good in this episode giving a much understated performance mostly alongside Peter Capaldi’s Doctor. Indeed he was pretty much acted as the companion for the majority of the story and I would say that you could imagine a few episodes with him accompanying the Doctor on some more adventures. He didn’t even seem that surprised about the whole bigger on the inside thing about the TARDIS so perhaps he had seen a TARDIS before, or it is not such a big shock as we think that it is. I did think that all the stuff about this being a final hurrah for the Doctor and Clara did seem a bit forced to me and it was nice that at the end she decided that he wasn’t a bad old sort after all and whilst this is nice, I am not sure how much longer it can last, especially with the new Doctor and his way with every other person that he meets as he is bound to do something that she is not going to like before very long. He again showed in this episode how he isn’t that bothered if people die around him as he just gets on with the job in hand until the problem is solved, which in this case was to try and work out how to stop the mummy from killing more people but it took a few people to die for him to be able to work it out which for the Doctor would be collateral damage once he has managed to sort it out he does then save someone who Clara thought he was happy to see die as just part of the whole ‘thing’ that they were doing that day, showing Clara that he is not entirely heartless, just not as human as she wants him to be, which is the main bugbear for Clara, I would say, the Doctor’s apparent lack of humanity, which being a Time Lord, you could argue that why would he have humanity when he wasn’t human, but his companions may well expect him to do. 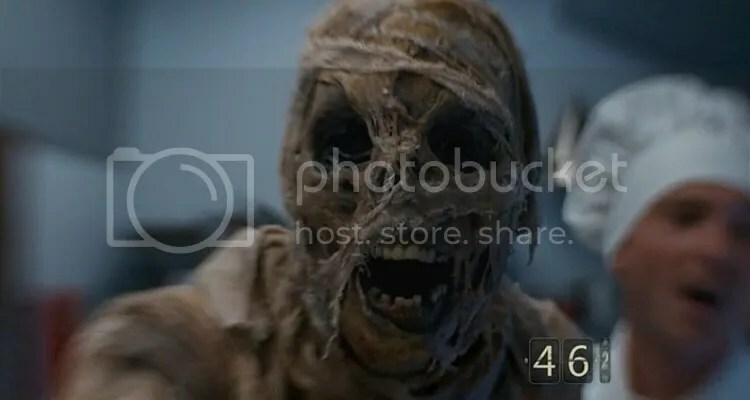 The mummy itself was well done and was very spooky indeed, what with the fact that only the victim could see it, and coupled with the little countdown clock leading to their inevitable demise it was suitable creepy. There was also the scene where the Doctor offered the professor jelly babies out of a cigarette case which is a lovely little touch and nod to the shows past. This was a relatively straightforward story with a beginning, middle and an end for Doctor Who in the Steven Moffat era which is what was so nice and refreshing about it. The main things that were never answered in the episode were who was Gus and why did he need to get people to solve puzzles in this manner? What was in it for him, or her, or whatever they are? Perhaps we will find out, perhaps we never will, but it will be quite frustrating if that little plot thread is not answered sometime soon.